For the second time in 19 months, an injury has shattered the hopes of the Chicago Bulls and their fans. Superstar Derrick Rose hobbled off the court Friday night after appearing to twist his right knee changing directions. Fans immediately feared an ACL tear similar to the one in his left knee that kept him out all of last season. The team announced Saturday that the point guard had in fact torn his medial meniscus. The team could not offer a timeline for return to play until Rose had surgery. Since the diagnosis seemed less serious than a second ACL tear, many fans breathed an optimistic sigh of relief. Unfortunately news following the surgery dashed that optimism. Dr. Brian Cole, the orthopaedic surgeon who performed Rose’s left ACL reconstruction, performed a medial meniscal repair Monday at Rush University Medical Center. The Bulls announced that Rose would indeed miss the rest of the season. A meniscus tear is the most common surgically treated knee injury. A tear of this C-shaped shock-absorbing cartilage does not heal on its own. An athlete almost always undergoes surgery in order to return to play. Two surgical options exist. The surgeon can use small arthroscopic instruments to trim out the tear, or he can try to sew it back together with stitches and anchors. He decides the best treatment based on the location and orientation of the tear. Only a small percentage of meniscus tears can be repaired. Regardless if a surgeon or athlete wants to have the tear sewn together, the surgeon doesn’t know if it will be possible until he sees the tear through the scope. Even MRI is unreliable at predicting if a tear can be repaired. This is the reason that the Bulls – or Dr. Cole or Rose himself – could not predict exactly when he would return to the court. Surgeons perform up to 850,000 meniscus surgeries each year. Partial meniscectomies, or surgeries to trim out the torn portion of the meniscus, comprises most of these procedures. A study of football players evaluated at the NFL Combine showed that partial meniscectomies are the most common surgeries players have undergone earlier in their careers. An athlete can often return to sports quickly after partial meniscectomy. The surgeon allows full motion and weightbearing since no repair needs to heal. The athlete can return to play in as few as 3 to 4 weeks. Meniscectomy does carry a risk of future degenerative changes from the loss of some of the shock-absorbing capability. Ask Dr. Geier – Is surgery necessary for a meniscus tear? On the other hand, if a meniscus tear does occur in an area with good blood supply and in a certain orientation, the surgeon generally he tries to repair it. Recovery and return to sports after meniscal repair takes 4 to 6 months. 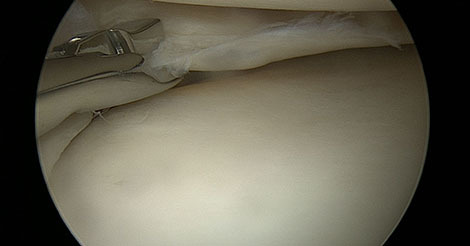 The surgeon limits knee motion and weight-bearing to protect the repair. If the athlete pushes through the rehab too quickly, he risks damaging the repair. 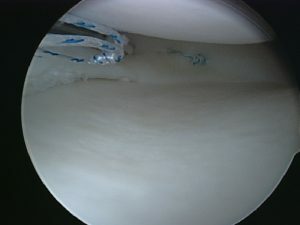 If the repair does heal, though, the athlete maintains the entire meniscus and theoretically prevents arthritis changes. Fans are clearly disappointed Derrick Rose will miss another season. Is a meniscus repair actually better long-term? While Rose would have returned to action quickly after a partial meniscectomy, it might have come at a cost. NFL players who have undergone meniscectomy have been shown to have shorter careers and play and start fewer games after surgery compared to similar players without a meniscus tear. Likewise, a German study showed that 80% of patients had no signs of arthritis years after meniscal repair surgery compared to only 40% that showed no damage after meniscectomy. That long-term success requires the meniscus repair to actually heal, which is a real concern. A recent study from the Hospital of Special Surgery in New York showed failure rates approaching 9%. Unfortunately the authors found that medial meniscus repairs (like the one Derrick Rose suffered) had a higher risk of failure than repairs of the lateral meniscus (like the one Oklahoma City Thunder guard Russell Westbrook recently had). An Australian study of elite athletes provided similarly discouraging results. While 5.6% of lateral meniscal repairs failed, over 36% of medial meniscal repairs failed. In the three seasons following his 2010-2011 NBA MVP award, injuries have limited Derrick Rose to just 50 games. Now Bulls fans, the team and Rose himself wait to see if this latest injury is a bump in the road on his way back to greatness or the beginning of the end to a promising career. Discover The Solution To Your Biggest Meniscus Injury Challenge Even If You Have No Medical Knowledge and You’ve Looked Everywhere and Haven’t Been Able To Find an Answer! A modified version of this post appears as my sports medicine column in the November 27, 2013 issue of The Post and Courier. Brophy RH, Gill CS, Lyman S, Barnes RP, Rodeo SA, Warren RF. Effect of Anterior Cruciate Ligament Reconstruction and Meniscectomy on Length of Career in National Football League Athletes: A Case Control Study. Am J Sports Med 2009;37(11):2102-7. Logan M, Watts M, Owen J, Myer P. Meniscal Repair in the Elite Athlete: Results of 45 Repairs With a Minimum 5-Year Follow-up. Am J Sports Med 2009;37(6):1131-4. Lyman S, Hidaka C, Valdez AS, Hetsroni I, Pan TJ, Do H, Dunn WR, Marx RG. Risk Factors for Meniscectomy After Meniscal Repair. Am J Sports Med. Published online September 13, 2013. Stein T, Mehling AP, Welsch F, von Eisenhart-Rothe R, Jäger A. Long-Term Outcome After Arthroscopic Meniscal Repair Versus Arthroscopic Partial Meniscectomy for Traumatic Meniscal Tears. Am J Sports Med 2010;38(8):1542-8. 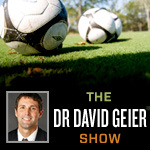 Episode 119: How can athletes prevent and treat skin infections in team sports? This program offers a comprehensive Q&A collection on diagnosis, repair, trimming out the tear, arthritis after surgery, reinjury, recovery and return to exercise.